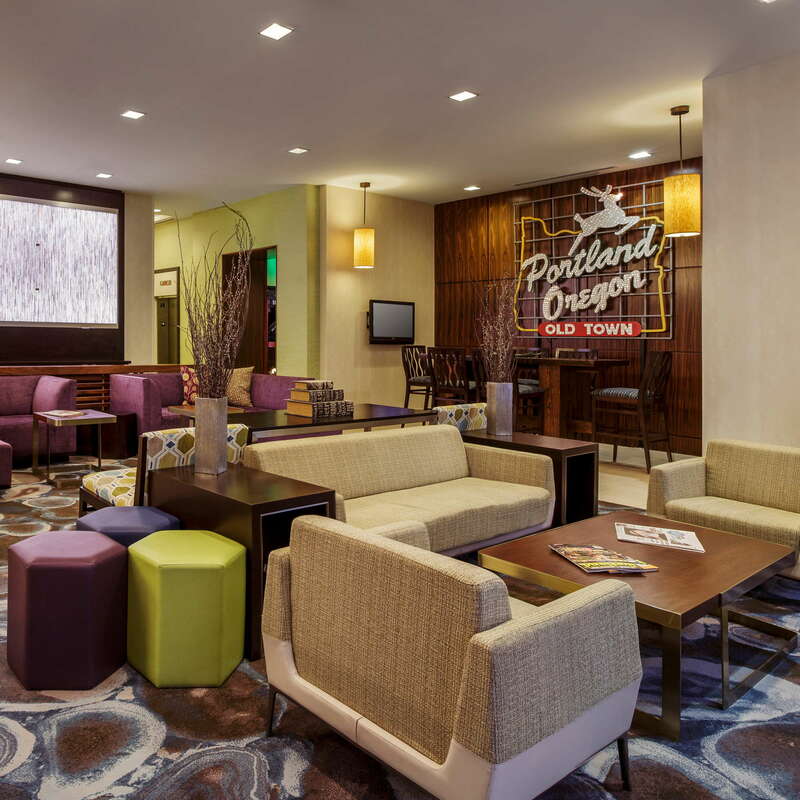 Located in the heart of downtown Portland, the Courtyard by Marriott Portland City Center is exactly what you’d expect from a mid-level Marriott property. 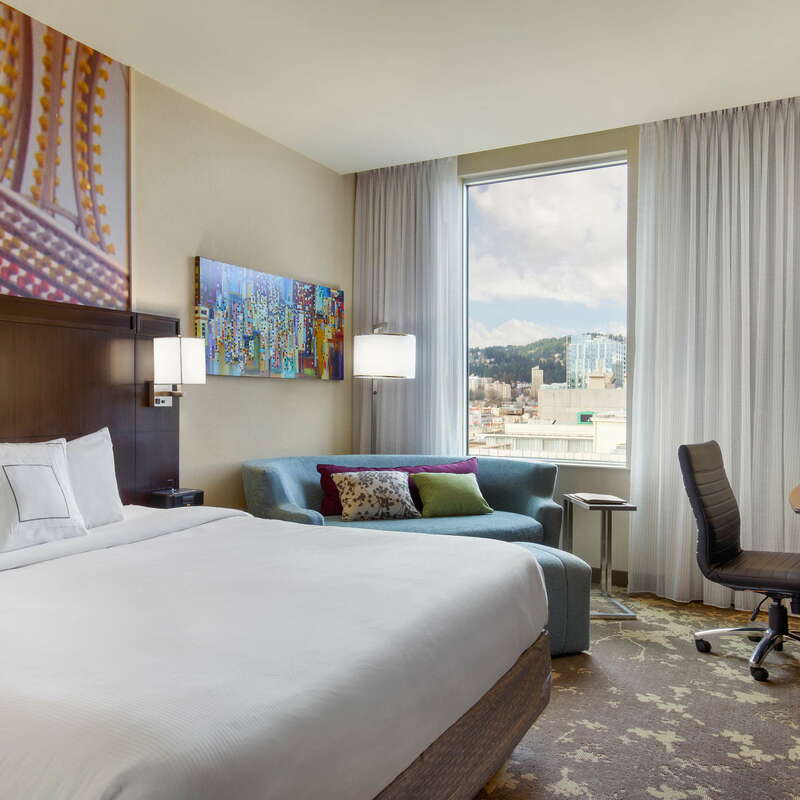 While this hotel is nothing to write home about, if you’re looking for a predictable and comfortable stay in a great downtown location, Courtyard by Marriott Portland City Center is a safe bet. 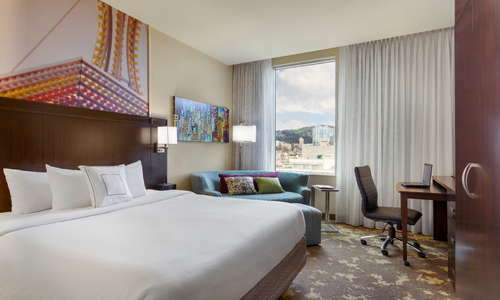 The rooms are comfortable and fairly spacious, and each comes equipped with a flat-screen tv, mini-fridge, and work space (great if you’re traveling on business). Also, free Wi-Fi! YOU SHOULD KNOW Those water bottles in your room? Yeah, they’re not free. 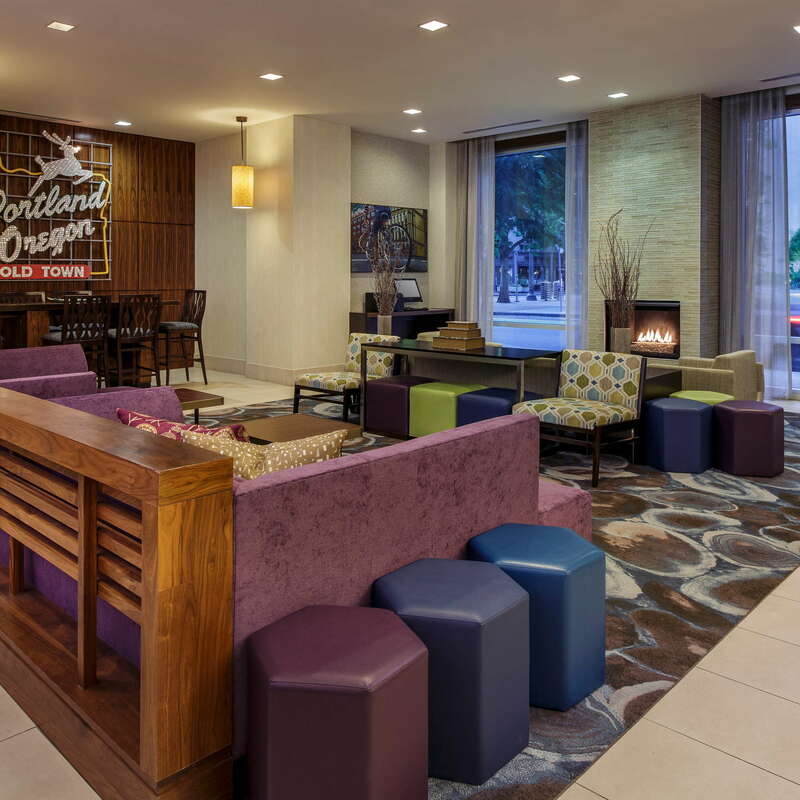 And if you open one and take a swig, Courtyard by Marriott - Portland City Center will charge you to the tune of $5 per bottle. Save yourself the insane fee and stock up on water before you get there. 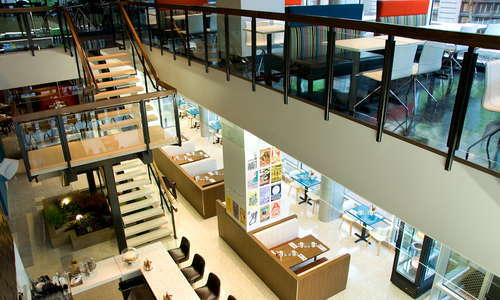 The bathrooms are large and modern, with plenty of counter space. 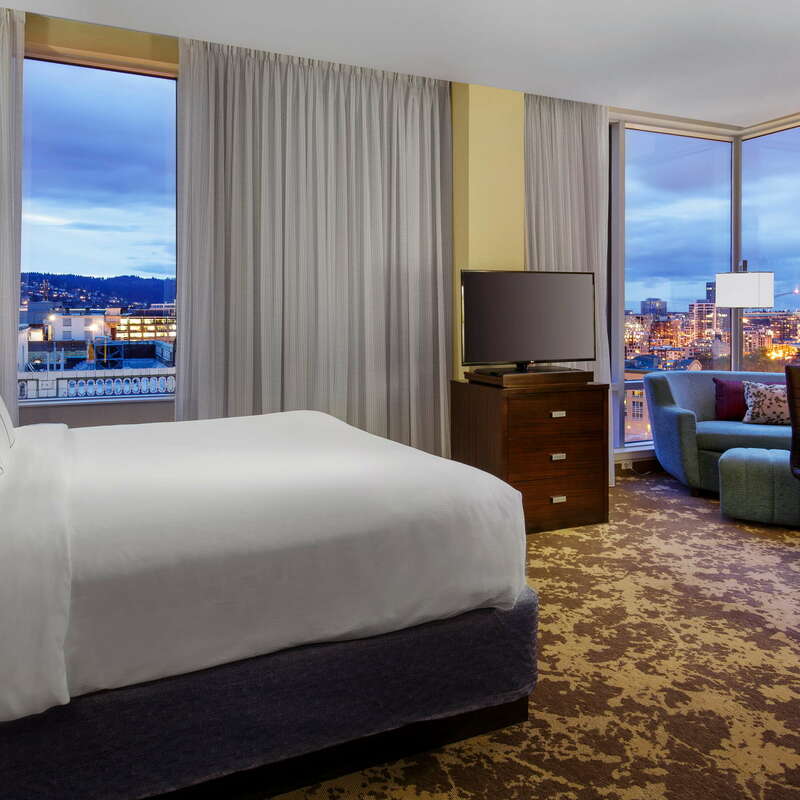 The bathrooms at Courtyard by Marriott Portland City Center also feature a shower/tub combination, so if you’re the kind of person who likes to take a bubble bath after a long day of sightseeing, you’re in luck. 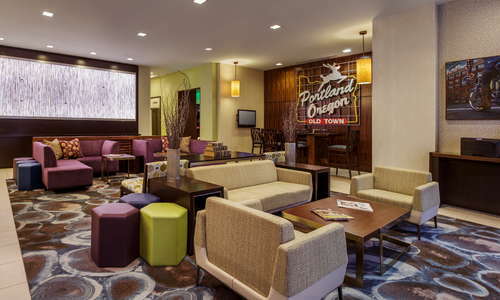 The lobby of the Courtyard by Marriott Portland City Center has a distinctive living room feel with plenty of couches and open seating. 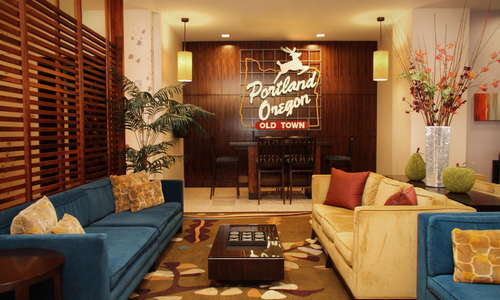 There’s also a great replica of Portland’s famous “White Stag Sign” that lends a local feel to an otherwise cookie-cutter design. 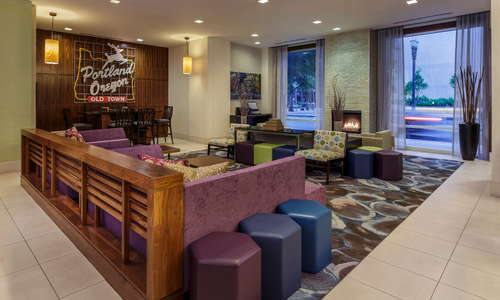 Before you head out for the day, make sure to stop by the lobby for a free coffee! 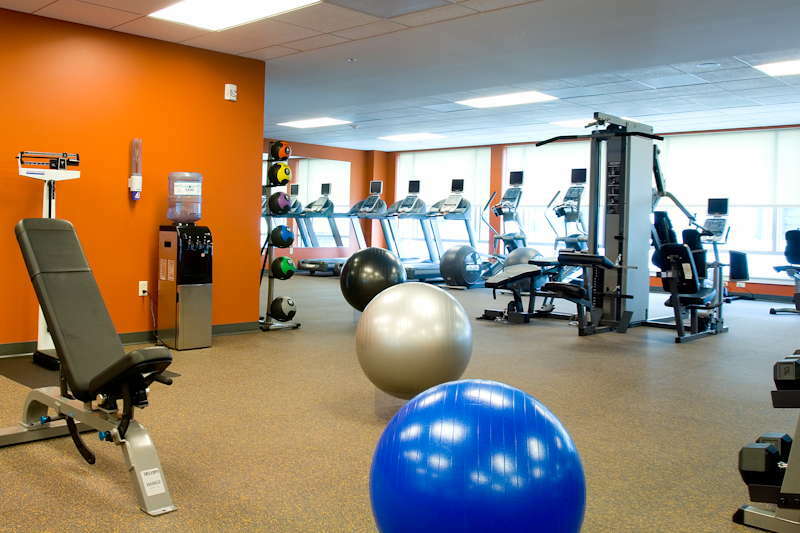 Courtyard by Marriott Portland City Center has an on-site gym that’s stocked with cardio machines equipped with personal television screens and plenty of free weights. The Original is Courtyard by Marriott Portland City Center’s on-site restaurant that serves up high-quality diner fare for breakfast, lunch, and dinner. 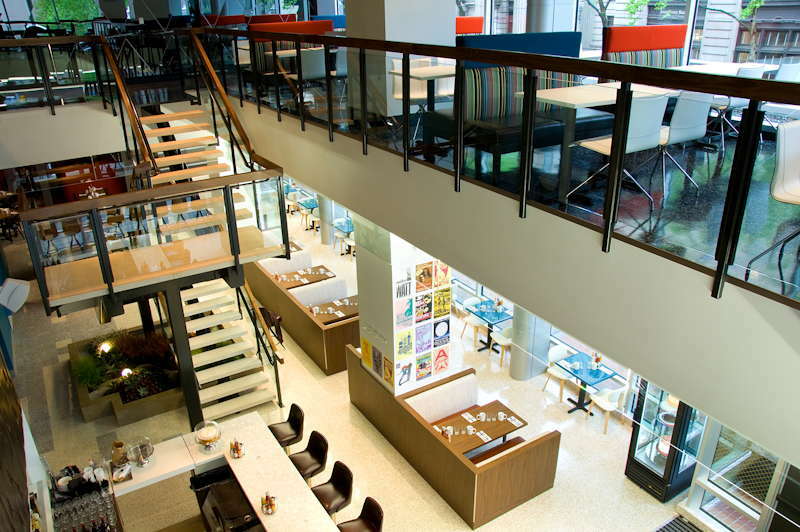 Don’t miss the Donut Sliders, a donut/burger combo that was featured on Food Network's "Diners, Drive-Ins, and Dives." 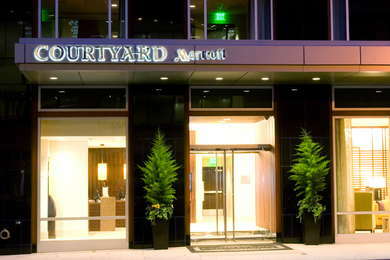 There’s no on-site bar at the Courtyard by Marriott Portland City Center, but you can grab a beer or cocktail at The Original with your meal or at their bar counter. 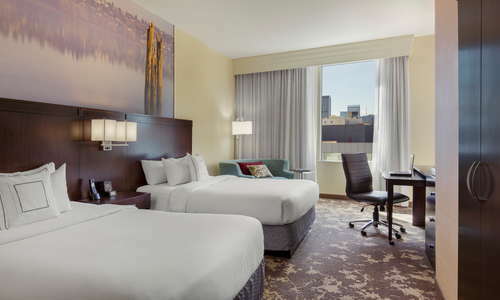 Downtown Portland is a walkable place, and the Courtyard by Marriott - Portland City Center’s location is within walking distance of many of downtown’s best restaurants, parks, and cultural attractions. 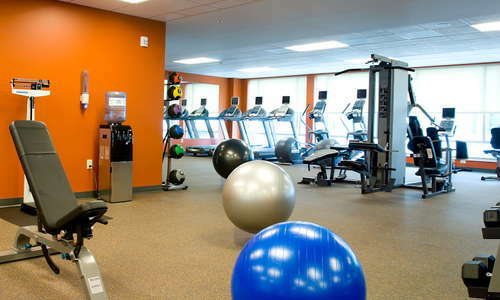 There’s also a MAX station just a 1-minute walk from the hotel’s entrance. 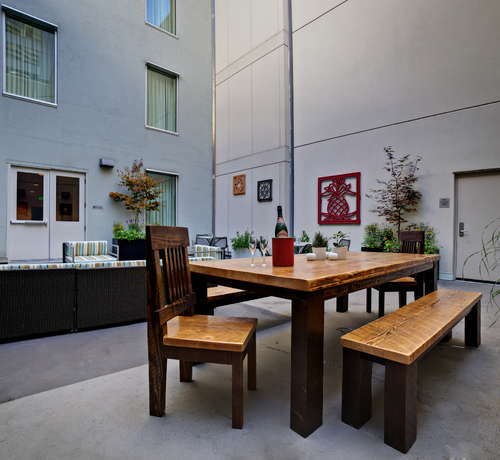 If you must bring a car, valet parking is $42 per night with unlimited in and out privileges. 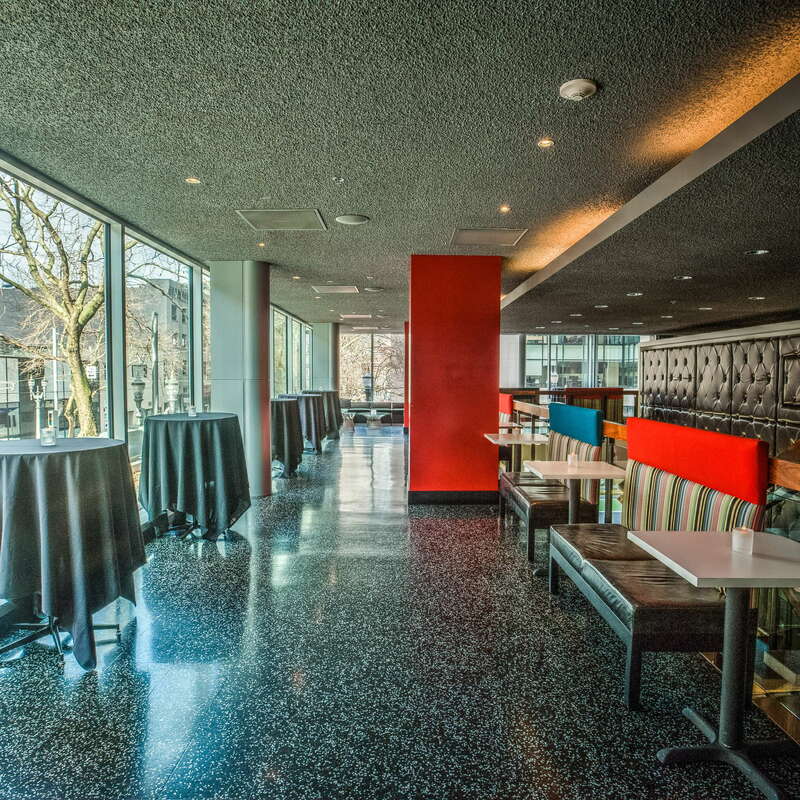 Home to what is hands down the best view in all of Portland, Portland City Grill (3-minute walk), located on the 30th floor of the US Bancorp Tower, serves steaks and seafood with 360-degree views of the city and Cascade Mountains. Another can’t miss is Sizzle Pie (5-minute walk), a pizza joint with an impressive selection of vegan pizza (if you’re not a vegan, don’t worry - they have traditional options on the menu, too). And of course, no visit to Portland would be complete without a stop at Voodoo Doughnut (5-minute walk), where you can enjoy cereal-crusted donuts and fritters as big as your head. 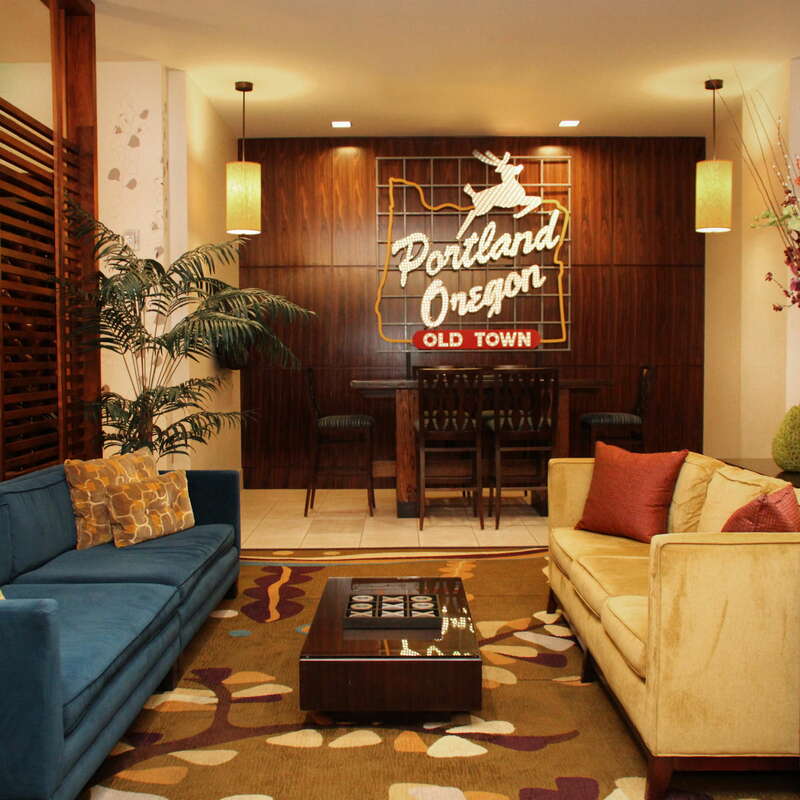 Portland is known the world over for its beer, and no visit is complete without hitting one of the city’s many taprooms. One of the best downtown is Bailey’s Taproom (2-minute walk), which has 26 rotating local brews on tap--and plenty of board games to keep you on hand while you sip. 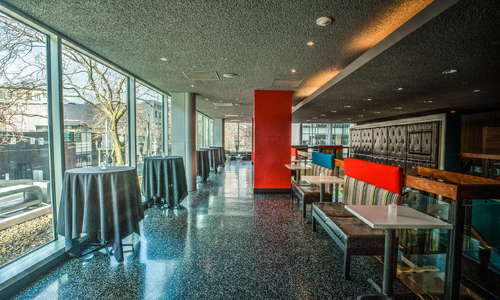 If you’re more in the mood for a cocktail, stop by Teardrop Lounge (9-minute walk), an upscale cocktail lounge specializing on classic cocktails with an impressive collection of high-end spirits. 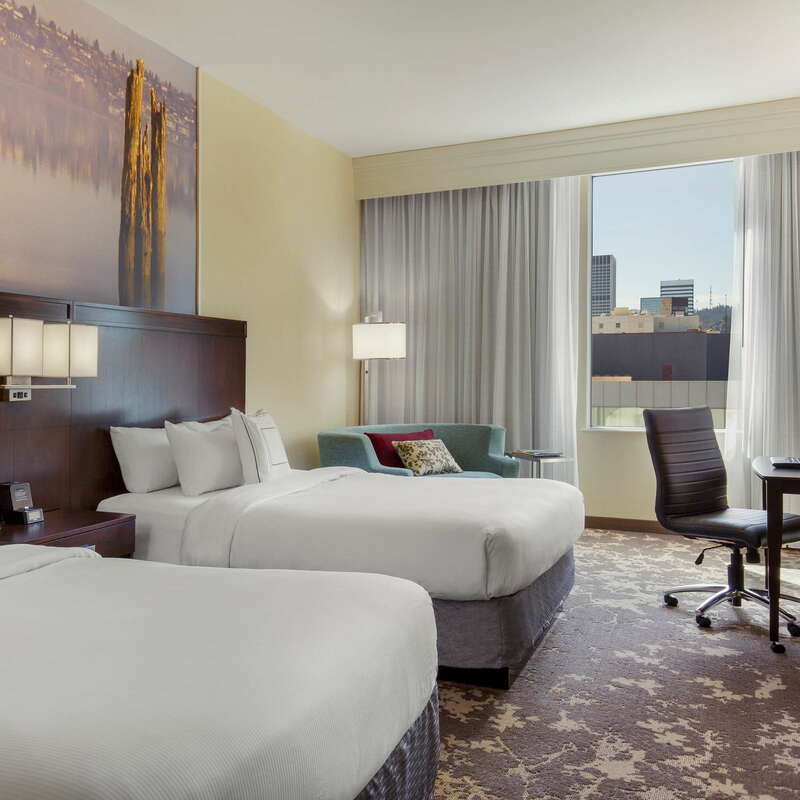 The Courtyard by Marriott Portland City Center is a standard, well-maintained Marriott property And while it won’t win any points for originality, it does provide the level of comfort and reliability you’d expect from the chain. 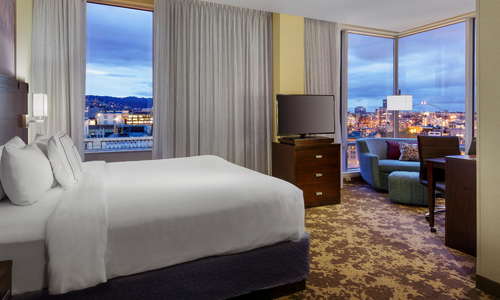 Plus, it puts you a stone’s throw away from everything downtown Portland has to offer - and there’s nothing wrong with that!